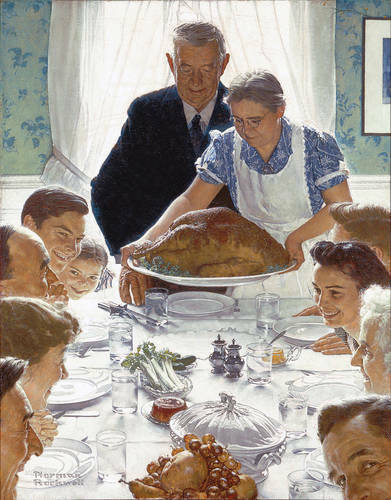 “Freedom from Want” by Norman Rockwell, 1943. It’s been all over Facebook. People are posting all the reasons they are thankful. My wife has joined in the Facebook thankfulness fun. As a teacher, she’s organizing her thankfulness thoughts alphabetically – using each letter of the alphabet to call to mind something for which she is thankful. I wonder what she’ll post about when she gets to “Z”? These words are from Lincoln’s Thanksgiving Day proclamation of 1863 and, like so many of the posts I’ve seen on Facebook, offer a myriad of reasons to be thankful. But what I appreciate so much about Lincoln’s thoughts on thankfulness – and the reason I share these words again – is that his thankfulness reaches its pinnacle not as he is talking about fruitful fields and healthful skies, or the abundant yields of plough, shuttle, ship, axe, and mines, or the population increase among the states. Rather, President Lincoln’s thankfulness reaches its pinnacle when he speaks of “the Most High God, who, while dealing with us in anger for our sins, hath nevertheless remembered mercy.” In other words, Lincoln is most thankful for what God does through Jesus Christ. This Thanksgiving, we certainly have many things for which we can be thankful. But as we give thanks for many things, may we never forget to heartily celebrate and give thanks for the most important thing: God’s Son, Jesus Christ. He is the One who gives us reason not only to be thankful for temporal blessings now, but promises us that we will be thankful in eternal dwellings later. Entry filed under: Devotional Thoughts. Tags: Abraham Lincoln, Christianity, Facebook, Gospel, Holiday, Religion, Spirituality, Thanksgiving, Thanksgiving Proclamation.